Women who have suffered major, life-altering traumatic life experiences and post-traumatic stress disorder might actually benefit from pregnancy in a pretty surprising way. Having a baby is an overwhelming experience, to say the least. There's obviously a huge amount of joy that comes with it—but the reality is, the fear of becoming a parent (not to mention giving birth) can be, well, a bit traumatic. But surprisingly, most women who have suffered other traumatic experiences in life might actually benefit from pregnancy in a strange way. Recent research found that pregnancy might actually provide relief from symptoms of post-traumatic stress disorder—at the very least, the findings suggest that pregnancy won't cause flare-ups in most cases. However, while most women could potentially see a reduction in PTSD symptoms thanks to pregnancy, about one in four women who have PTSD might actually suffer increased symptoms. For these women, the effect isn't just present during pregnancy—it might also hurt their ability to bond with their baby and compound their risks of developing postpartum depression. The findings come from the University of Michigan Medical School and School of Nursing and highlight the need for PTSD screenings for pregnant women. PTSD can caused by anything from sexual assault or abuse to living through a natural disaster or car accident. The study points out that cases of PTSD often go undiagnosed. There are a few factors that determine whether pregnancy will lessen the affects of PTSD or worsen them. Of the 319 women observed, over half experienced high levels of PTSD symptoms early in pregnancy but saw a reduction in symptoms as the pregnancy went on—but those who suffered new trauma during pregnancy had the worst experiences with symptoms both during and after pregnancy. "We hope our results give a message of hope that women who have a past diagnosis of PTSD aren't all headed for a worsening while they're pregnant," says Maria Muzik, M.D., M.S., the psychiatrist who led the study. "But we also have highlighted a vulnerable group that has a heightened risk of worsening symptom and postnatal issues that could have lasting effects for both mother and child." The team of researchers interviewed the women observed twice during pregnancy. 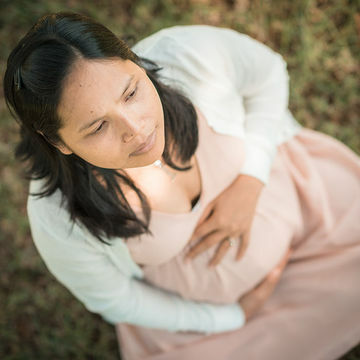 Their findings indicate that women who have strong support systems tend to be protected from worsening PTSD symptoms throughout pregnancy—which means that partners, families and friends can really help women with PTSD lead healthier pregnancies. One thing is clear: PTSD screenings are especially important for pregnant women. "With a few questions and screening measures, they can identify women who are experiencing risk factors, and heighten their awareness for support and treatment," Dr. Muzik says. "Preventing the worsening of symptoms could reduce their chance of post-birth illness, and protect their future child from the lasting ill effects that a mother's mental illness can have."